One of my pet peeves is having pieces of mail laying around on my desk. With the wide-body, La Aroma De Cuba cigar box, I found a solution to this problem which keeps my work space clean in an elegant way. These wonderful 11 inch wide cigar boxes are covered in beautiful cigar box artwork – and they are wide enough to hold standard letters. 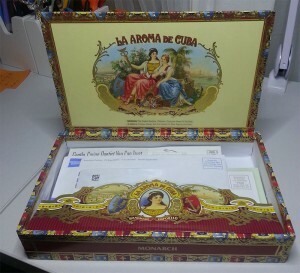 Gone is the classic in-box I once had, replaced by this awesome “Aroma De Cuba” cigar box. 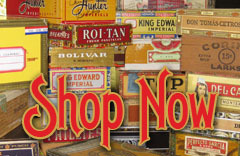 Pick one up today and add some classic cigar box artwork to your desk – and put that unsightly loose mail away! Wider boxes are great for this – but most cigar boxes will help organize your work area and help add a touch of class at the same time. I have way too many on my desk – pictures on the way, but that’s a story that I will share soon. 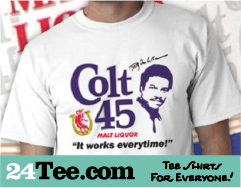 Hi, I was delighted to find your website and really need some help. I’m very interested in getting started making cigar box purses but ran into a problem right away. Not knowing I could buy boxes on line in perfect condition, I purchased some from a local store. They are typical boxes with the vaious logos on them. The problem: the top of the box is very thin. All the latches I can find (on line and otherwise) are designed to be placed with both components on the front side of the box. With the boxes I have, I don’t have enough room to put hardware on the side of the top of the box. I don’t know what to do next! I hope I’ve made my question clear and that you can help me. Now that I know about your boxes I won’t have to get mine from local cigar shops since I never know until I get home whether they are going to be usable once I get the decals I don’t want to use off. Thanks so much for any help you can offer.